Hello, and welcome once again to Flatpicking Guitar Magazine’s free lesson portion of our monthly newsletter. Assuming that I post the lesson in time, each month when you click here, you will find a great new tune to expand your flatpicking knowledge. This month I’d like to share “Cotton Patch Rag,” a great tune from the Texas fiddling tradition. 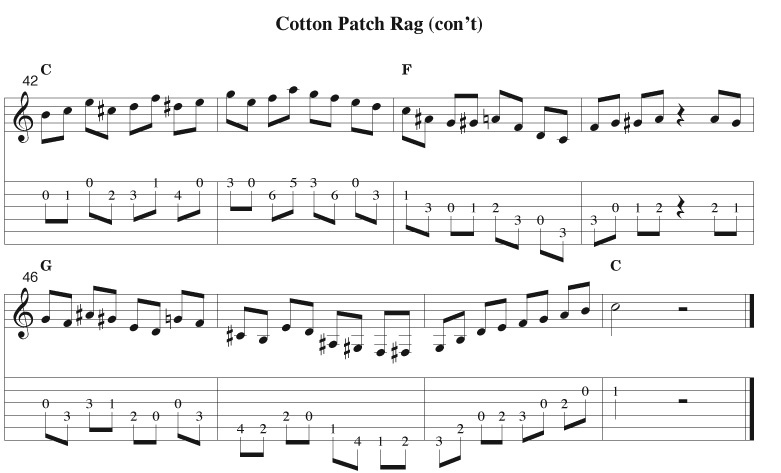 “Cotton Patch Rag” is the perfect tune for jamming on. Its simple chord structure and form make it great for beginners and intermediate players to pick, but also intrigues advanced players to come up with complex licks over the simple chords. If you are a flatpicking guitarist who enjoys improvising or coming up with your own arrangements of tunes, this tune will keep you busy for years! In fact, “Cotton Patch” often shows up at flatpicking contests. To me, this tune has an AABB structure. The “A” section is based on a single note melody and the “B” section is the cross-picking part. Some arrangements of this tune have more than two sections, but they have always seemed more like variations to me. Also, In the fiddling tradition, the soloist will often take more than one solo in row -- so when a Texas fiddler’s version is transcribed, it would appear to have many sections. For this lesson I have presented two versions of each section and a swing variation over the chords that incorporates some interesting licks. Check out the lesson mp3 to hear the ideas in action! While picking the “A” section, I like to keep a good pulse to my eighth notes. This is accomplished by accenting beats one and three of each measure and carefully articulating each note. Practice slowly to make sure your left hand fingers and right hand pick are synchronized, i.e. you are fretting the notes at the same time as you are picking them. The “B” section’s cross-picking picking idea is indeed a classic. 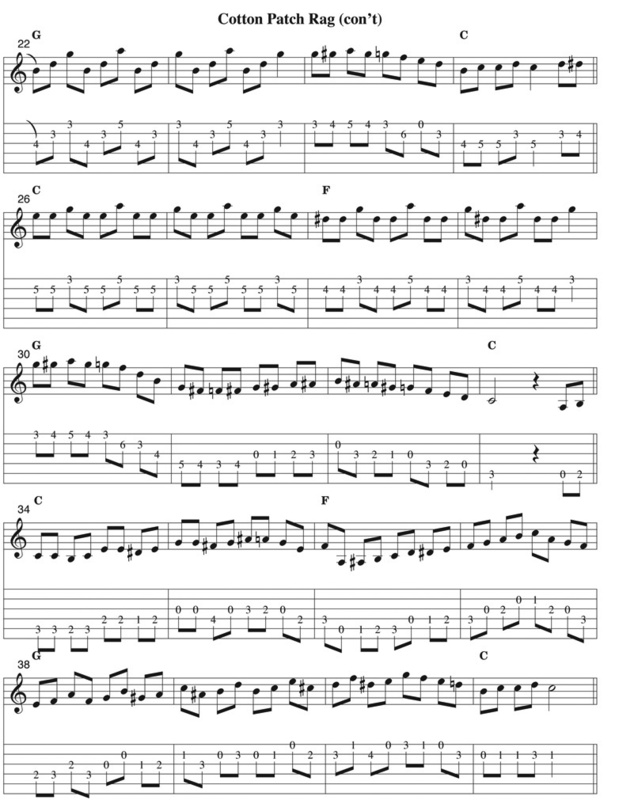 It’s based on the syncopated pattern of a fiddle “shuffle.” I use strict alternate picking for this pattern. This way, my cross-picking is using the same picking technique as my regular eighth notes. The tricky part, of course, is that every time you return to the same string, your pick is on the opposite stroke it was the last time you picked that string. Again, practice slowly to ensure your hands are working together to accomplish this goal. Even if you are familiar with this piece and already play it, I encourage you to check out my swing variations. You just might find a lick worth stealing. Feel free to take any of the ideas you like and employ them where you can. 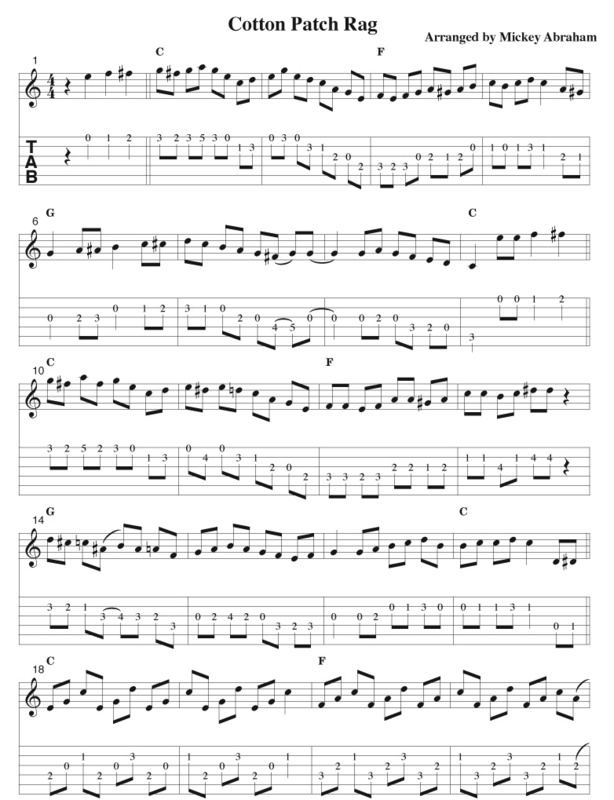 I based the intervalic lick at measures 38-40 on a typical “thirds” exercise, but I tried to incorporate half-step connectors to make the line sound more interesting and more like a real Texas fiddler. One other phrase of interest is the descending lick played over the G at measures 46 and 47. This line is based on the G half/whole diminished scale, and really brings out the sound of “organized tension” when resolving to C. I know you want to try to play these licks! I hope you enjoy adding this amazing tune to your list. I am sure your picking buddies will either know it, want to learn it, or will have something to play over it. In closing, “Cotton Patch Rag” is a tune that due to it’s simple structure is appealing to learn at any level, but at the same time it unleashes a myriad of possible variations to keep even the most advanced soloist intrigued. As always, if you have questions or comments on this e-lesson, or any ideas you’d like to see here in the future, just drop me aline at michabraham@comcast.net.